I sometime hear colleagues say basal bark on invasive honeysuckle “sort of” works. I find basal bark with Garlon4 kills nearly all of the time. Note in the photo below the blue tree marking paint I applied to the stem. 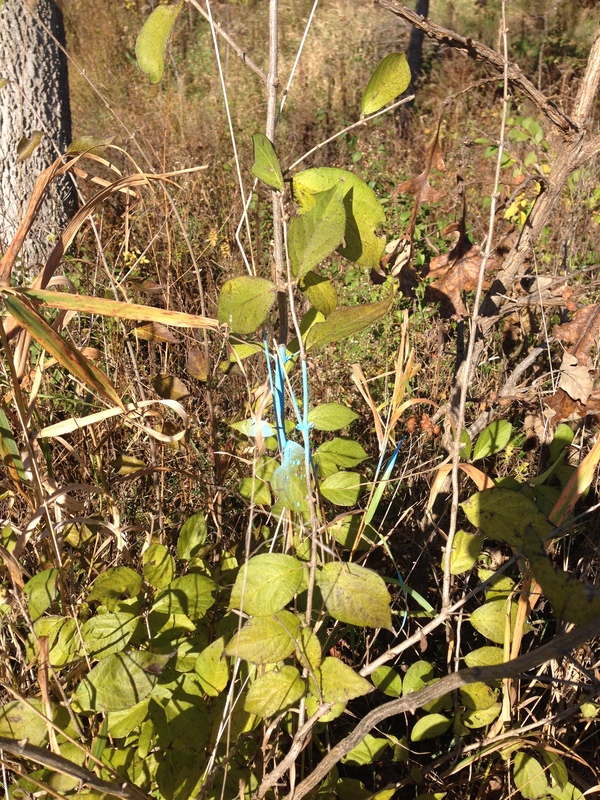 In the fall, October 10, 2015, I sprayed a little basal bark solution on the lower stems of this plant and about 50 others. By marking the stem with paint I can return later and see that indeed the plant is dead. If I took you to this area and exclaimed that I basal barked the shrubs you might say it “sort of” works. You would say that because there would be live honeysuckle here, there, and seemingly everywhere. That would be until I pointed out that every shrub I herbicide sprayed and then marked with paint is dead. There are shrubs around the treated plant that are not dead because they were not sprayed. The plants sprayed are dead. So applying basal bark in October with the leaves still on worked. In my next post, I will tell you about a spring application. Great job differentiating between herbicide effectiveness and user error (un-sprayed plants). Thanks. I have learned that occasioanlly marking plants with blue tree marking paint helps me appreciate what is happening with my efforts. Is is shocking how many small shurbs are missed.